Today's So Shoe Me is the Vreeland Croc-Effect Leather Sandal by Charlotte Olympia, $875, available at Net-a-Porter. Ecotic skins are in and these croc textured leather heels will add the perfect mix of retro and new into your warm weather wardrobe, The zany sculpted heel calls back to the 90s while the sophisticated neutral hues make this a classic that can be worn to the office or out for late-night drinks. Pair these retro meets modern platforms sandals with a Matrix vibing leather skirt and a turtleneck bodysuit for a cyber chic look this season. So Shoe Me a pair of croc-effect dandals that will add an exotic edge to my favorite summer pieces. Today's So Shoe Me is the Nightmare Reflective by YRU, $125, available at Ashbury Skies. Get heavy metal and reflective with these flash reactive boots by YRU. In the dark these boots have a neutral oil slick tone, but when the lights hit these platforms they'll glow in bright iridescent hues making them the perfect statement heels to splurge on. The chunky platform and zip-up front is right on trend and adds some all night comfort to these club kid cool shoes. Pair these high shine heels with some metallic leather separates and a peachy lycra bodysuit for the perfect post-festival concert look. So Shoe Me a pair of rad reflective boots that will add a space age edge to my favorite nighttime looks. Today's So Shoe Me is the Patent Strappy Heel by Chiara Ferragni, $519, available at Revolve Clothing. 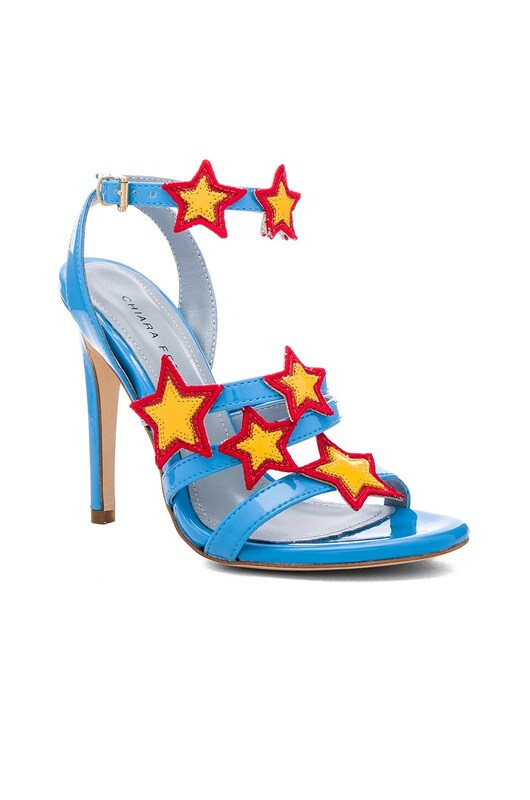 Add a superhero spin to your summer style with these strappy starry stilettos by Chiara Ferragni. This glossy graphic heel will add a star studded punch to your favorite summer staples. The bright shades of yellow, red and blue creates a fresh pop of color with a comic cool style. Pair these on trend party heels with a little red dress and a golden star headband for a chic wonder woman vibe. So Shoe Me a pair of polished patent leather stilettos that will add a pop of power to my favorite summer separates. Today's So Shoe Me is the Tassel Fringe Flatfrom Sandals by Whitepepper, $113, available at Forever 21. Get in Flatformation with these super trendy sandals by Whitepepper. The super chunky flatform sole is all the rage this summer and the tassel fringe front adds a formal edge so you can dress these genuine leather shoes up or down. The oxford style upper and club kid cool sole create the perfect mix of polished and party this summer. PAir these flatforms with a denim skirt and graphic crop top for a relaxed daytime look. So Shoe Me a pair of leather flatform sandals that will add a fresh fringe finish to my everyday style this season.